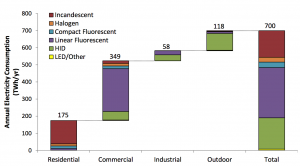 The chart breaks down the usage but lamp type and Sectors: Residential 5.8 billion, Commercial 2.1 billion, Industry 0.1 Billion, and Outdoor 0.2 billion lamps for a total of 8 billion light bulbs in use in the United States. This chart shows average hours of operation. One reason the use of incandescent lamps isn’t too troubling are the low hours of use. It doesn’t pay to use expensive lamps if they’re rarely on. Residential 1.8 hours, Commercial 11.2 hours, Industry 13.0 hour, and Outdoor 11.7 hours per year. Two graphs that show usage of electricity and light output. Table C2 shows Lighting Efficacy Assumption, which gives a good snapshot of how efficient certain lamps are as of 2010. 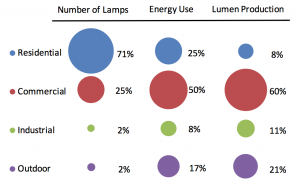 Note all of these lamp types are getting more efficient with the exception of Incandescent lamps. LEDs are making the most progress.